excel in sports | "Hey, Mitz!" ELITE QUALIFICATION? I got in ‘routine-shape,’ entered the meet in mid-January, hoping to qualify for Elite (my dream). Well, I tried, but I had to ‘water-down’ my routines – I was not really ready. Not confident. The success? I did not run away screaming. I made it through all four events and did not die. I was a gymnast, but I would repeat the Junior Olympic (J.O.) level for a third year. Baah. I felt very “junior.” But…I accepted it. Because that’s where I was at. Message #4: Plant a seed and nurture it. Watch it grow, and you never know what will happen. I was home, grabbing a snack in the kitchen. My mom, Lorie Mitzel, was in the kitchen, too. A natural You-can-do-anything person, my mom often encouraged me to reach for goals. 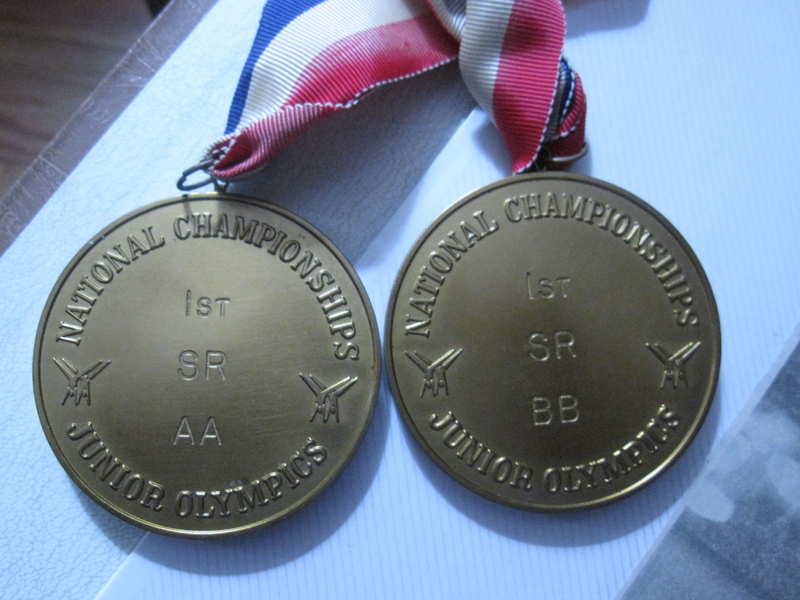 She said: “Lisa, since you didn’t make Elite, what’s your goal this season for Junior Olympics?” Hm, I hadn’t thought, so I joked: “Oh, I guess I’ll just win Nationals…” My mom raised an eyebrow, “Wow, wouldn’t that be something.” We were both surprised–it seemed like a huge dream–National Champion…huh. Sophomore at Canyon H.S. 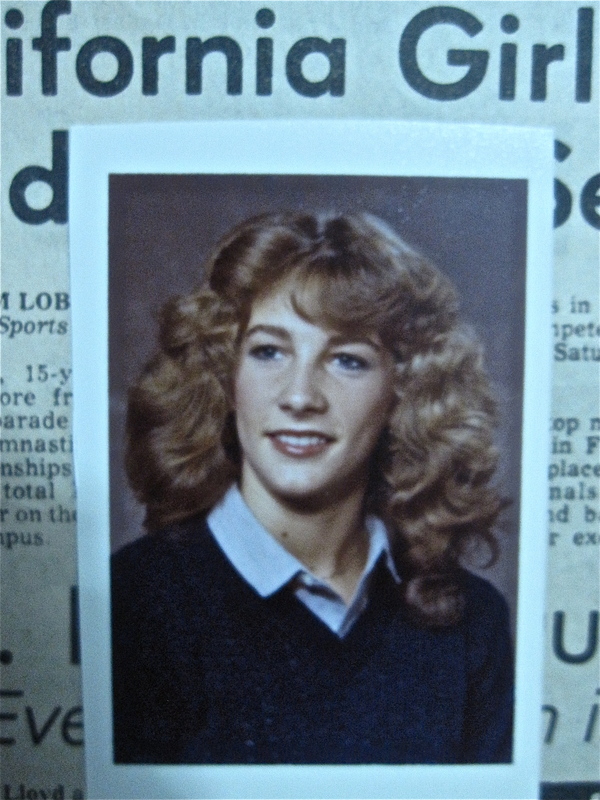 Me…Mitzel, at 15. PRACTICE MENTAL SKILLS, RELAX UNDER PRESSURE. Even though I wasn’t seeing Ken and Lynn any longer, I continued to practice all the mental tools. I stood in front of the equipment at the gym, took long deep breaths, talked to myself, “You can do this, Lisa, one move at a time.” I imagined each skill, visualized it, and what it felt like – a series of photos, still shots – because separately, each shot was a position I could “see” and “feel.” My body moved from one to the next. Gradually, I got better and became more confident. Emotions–even–I didn’t judge good or bad, I was simply present in my mind & body. February and March, competition really improved, I was relaxing under pressure. Message #5: When in doubt, break it down. Break it down more. And keep your mind still and present, no judgment. Mental Skills pyramid from Ohio Center for Sport Psychology. Great way to approach training & performing at your best! ATTITUDE IS EVERYTHING. For competition, I prepared in every way, then ‘let it go.’ I prayed with my mom and simply believed that something good would happen. We stayed positive. We sent Good Luck to everyone at the meets – opponents, judges, coaches. We said: “Let everyone be their best.” And though I still got nervous, I channeled that energy to perform. And with all of that good stuff goin’ on…I began to win. I exuded calm and joy while competing. I was scoring high and people noticed me. The fearful athlete was fading–a new performer was rising. APPROACHING 1980 J.O. NATIONALS. At the State and Regional competitions, there was a lot of talent. Lots. But guess what, I ended up winning! Me! And at Sectionals (Western U.S. Championships), I placed second all-around! No kidding! Finally, in May, Nationals were in Tulsa, Oklahoma, Oral Roberts University. 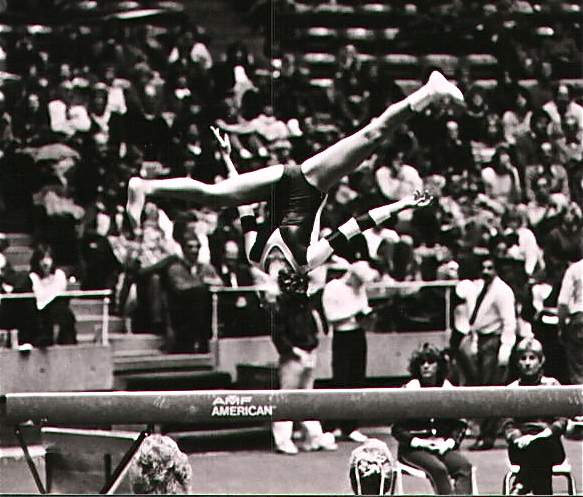 AT NATIONALS – there were crazy-talented gymnasts, like Mary Lou Retton (who in 1984 would come to win Olympic Gold at the Los Angeles Games). If I looked around, it was intimidating. So all I could do was focus on me: Breathe, concentrate, talk to myself. There were three days of competition – Compulsories (my strength), Optionals (not my strength), Individual Finals (Optionals). Day 1, I didn’t think about my competitors, I concentrated on being in my zone. I was strong in Compulsories, which I needed to be, and at the end of the day, get this, I was in first place! Again–me! It was nuts. From the Mitzel Files…in the middle of back roll to handstand. The photo caption says, “Mitzel uses her head to lead.” They didn’t have a clue how much I was really using it. J.O. competition has age groups: Juniors – 14 and under. Seniors – 15 and up. I was 15, so in the Sr. age group. WHAT HAPPENED NEXT? On Optional day, I wasn’t thinking about results, that was out of my control. I could only control ME. So you know what I did – I went for it! Had fun! No fear! And every event was great! Vault, Bars, Beam, and Floor. I stayed focused and enjoyed the meet. I did my job on each routine. Other coaches patted me on the back, “Nice job, Lisa.” It felt good. Finally, the scores were totaled (Compulsories and Optionals). How did I do in the All-Around? Did I make Top 10? Maybe Top 6? Results were posted on a wall. I walked over, saw a white piece of paper with names and scores. I scanned the list and…there, right there, in the top #1 spot was “Lisa Mitzel.” OMG! OMG! I couldn’t believe it! I was first? Me? I won? HA! I was a National Champion! My coach, Jim, laughed so hard. I was STUNNED. FINALS: Next day, I competed in 3 events, Vault, Bars, and Beam. Vault, I placed 5th, Bars, I fell. That left Beam. That night, many girls fell off beam. The arena was packed and all eyes were on one person competing at a time. The pressure was thick. I mounted the beam, I was relaxed and IN my zone, I was hitting, double backhandspring, back tuck, turns, leaps, doing great! Then I realized, I didn’t want to risk my front flip – so I skipped it, dismounted, and nailed it! My coach said, “Uhh, I think you forgot something.” I smiled, because, I just hit my routine in Finals. But I was sure I’d get a deduction, not enough difficulty. But…the score was good! A 9.6, and that won beam! 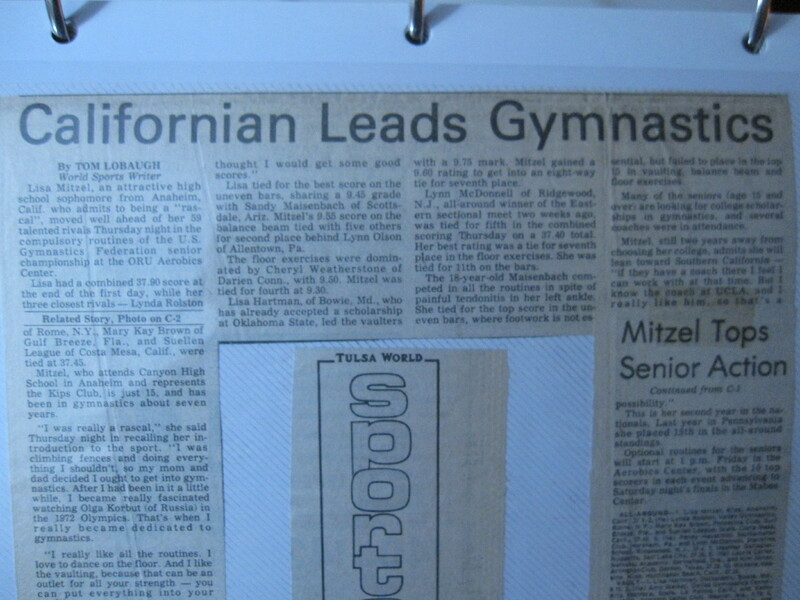 I was the National Beam Champion, too! I was now a 2-Time National Champion!!!! It was a Miracle. I was rock bottom just months prior. I nearly quit. I still struggled inside (tumbling still scared me). But the mental skills and positive attitude conquered all. It was a miracle that I did it – won 2 National titles. And people who helped me: My coaches at Kips, especially Jim Fountaine, pushed me. Ken and Lynn, were so patient. My teammates, my parents – especially my mom – all were my entire life line and support. I hope this story helps you realize – You can conquer any obstacle. You can. Message #6: REACH for a goal, SWEAT and work hard, and BELIEVE in yourself, and you CAN ACHIEVE. Sport is so darn mental, and competitive, you need magic tools in your brain pocket if you want to really excel. One tool I strongly recommend, and you make think I’m completely nuts, is a child-like approach – Pretend. Now, I’m totally serious. I am. Because when you pretend you’re Wonder Woman, or you impersonate an awesome athlete – like Gabby Douglas, Missy Franklin, or Hope Solo – you reach for the highest energy and skill level on the planet, and you get a boost, a rush, a flair! and you CAN ABSOLUTELY produce exceptional performances. You can. When I was 7, my sister, Sheila, and I pretended we were actresses and singers. We danced and sang in our living room as if we were in the movie, The Sound of Music. Sheila, two years older, got to be Maria. I was one of the children. But it didn’t matter who was who because we played the tape, sang and danced, and we were fully absorbed in that imaginary world: In Austria, singing “Do-a-deer” on the grassy hill, at the fountain, riding bikes. We were silly and loud. Confidence oozed from our beings. We were IT. And through our imagination, through PRETEND…we transformed into amazing performers. In gymnastics, that screwball balance beam requires much pretending. Otherwise, you’re screwed. I’d pretend my feet were massive, like Sasquatch, so there’s no way my foot could slip off. Or that my hips were cable-strapped to the beam, no way I’d lose my balance. This gave me confidence and it worked most of the time. 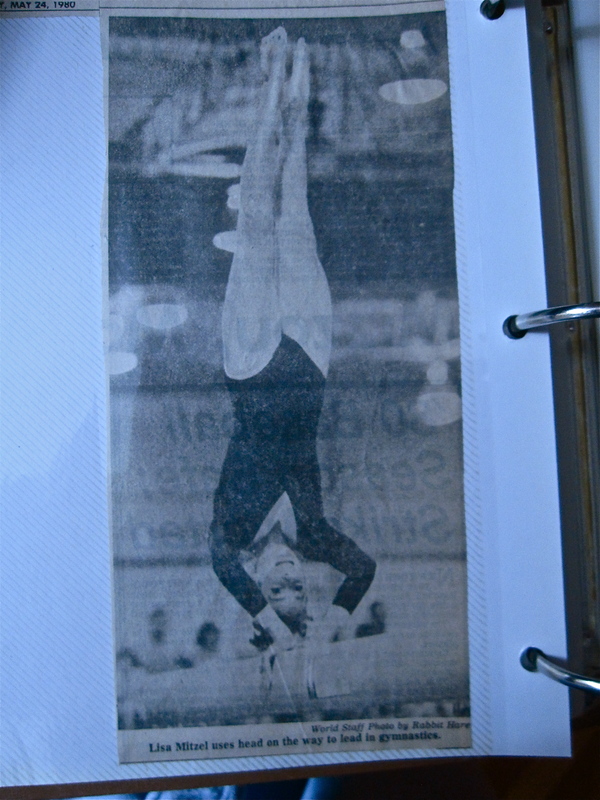 Until age 12, I had to compete a side aerial (a no-handed cartwheel). This foolish trick, side-flipping through space to land on the beam, was thrilling, but also risky. It jerked my thoughts away from sureness. I kept concentrating, but I fell. A lot. What was wrong? I did many, many, MANY side aerials on the line on the carpet, 100, and on the low beam, another 100, and I stuck them. I was a machine. But on the high beam, especially in competition, with judges, parents, and competitors all around me – my focus and confidence blew away with the wind. Enter, silly mother with good ideas. (And, this is silly.) It’s the day before a meet. I’m concerned about nailing the side aerial. My mom says: “Lisa, you won’t fall. You can’t fall. You see, God has you. He’s a puppeteer high above you, and you are the marionette. You are attached to his strings. He’s holding you up!” I sat there, “Huh?” trying to imagine me on the beam, with strings going up to heaven, and God controlling me, holding me up. My mom laughed and smiled, exuberantly. She acted convinced. Like it was true. She was PRETENDING. So…I tried. Old man in they sky, white hair, white beard, white robe, he’s a puppeteer, I’m the puppet. Got it. The next day, I competed. Nervous stomach arrived (always did). I went to beam and warmed up. The side aerial felt fine, but nerves lingered. I paused, recalled my mom’s voice, held onto that image of God and his puppet strings attached to me, all the while hearing, “You can’t fall–he’s holding you up!” I started to get into it, really pretend. I began to relax and feel the confidence – I couldn’t fall. It was impossible. Side aerial – mid air – competing for NCAA National Champions, the University of Utah.